Accra, Ghana - Liberia’s Vice President, Chief Dr. Jewel Howard-Taylor, is calling for a collective approach to reversing the spread of ANTI-MICROBIAL RESISTANCE(AMR) as she proffers several options, including creating awareness and education on the overuse and misuse of antimicrobial medicines. 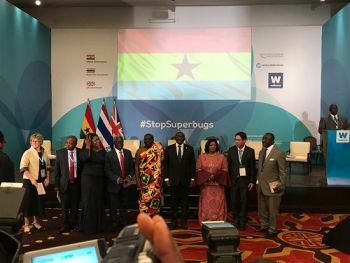 “We acknowledge the need for an urgent collective clarion call to act now to combat AMR; given that the current trend of the growing number of infections including pneumonia, tuberculosis, gonorrhea and salmonellosis; are becoming harder to treat as antibiotics recommended for treatment have become less effective,” VP Howard-Taylor said. According her, AMR is a threat to humanity, global health, food security, national development and increased mortality around the world, but especially here in our region of the world. The Liberian Vice President told participants at the Call to Action Antimicrobial Resistance Meeting held Monday, November 19, 2018, in Accra, Ghana, that antimicrobial resistance is one of the most significant threats to public health in the world today. Speaking further, VP Howard-Taylor proffered other options to combating AMR as the improvement of infection prevention and control, sanitation and hygiene, strengthening surveillance for AMR strengthening and enforcing regulations on antimicrobial medicines as well as scaling up support for interventions on AMR across all sectors by using a workable approach under the one health system mechanism. On home front, the Liberian Vice President, who chairs the One Health Steering Committee in Liberia, remarked, “Being cognizant of this threat, my nation, Liberia, has also joined the global One Health plan – an approach linking human, animal and environmental health sectors has proven to be one of the best models that strengthens cross-sectorial, national and inter-country capacity for integrated disease surveillance and response in the Economic Community of West African States (ECOWAS) and our global village”. The program graced by an array of key healthcare actors, policy makers at the top of which was Ghanaian President His Excellency Nana Addo Dankwa Akufo-Addo. VP Howard-Taylor went on to identify weak enforcement of legislations or policies on prudent use of antimicrobial medicines, including manufacture and circulation of counterfeit medicines as few of the major factors contributing to AMR. She recalled that in 2016 Liberia conducted the Joint External Evaluation (JEE) of the International Health Regulations 2005 (IHR2005), in collaboration with the World Health Organization (WHO) which recommended that Liberia develops a National Action Plan (NAP) on AMR based on the country’s situational analysis and the Global Action Plan on Anti-Microbial Resistance. This action, according to VP Howard-Taylor, was belatedly taken after the country experienced the EBOLA Epidemic, noting however that, “.....over the period, we have worked together to overcome the devastating effects of the Ebola virus disease outbreak through implementation of the above recommendations”. She stressed that while gains have been made over the period, more needs to be done to strengthen prevention, detection and response capacity to mitigate shocks to our health system. The Liberian Vice president revealed that in an attempt to effectively deal with this issue, the Liberian National Work Plan has put in place a robust plan, which includes the One Health Steering Committee in order to strengthen and sustain a multi sectorial and disciplinary approach. 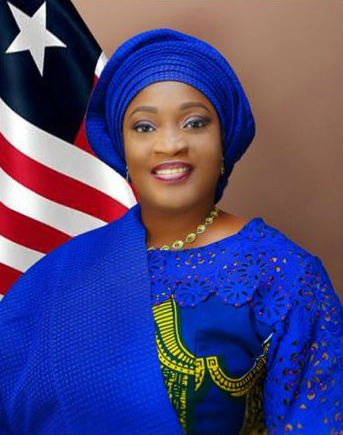 She recalled that, “in June of 2018, we validated and launched the National Action Plan on Prevention and Containment of Antimicrobial Resistance (AMR) in Liberia, for implementation over five years”. Meanwhile, VP Howard-Taylor is encouraging all stakeholders, especially governments, to provide the needed financial and technical support to combat AMR and engender innovation to create the next generation of antibiotics; which are already on demand across the World. VP Howard-Taylor warned, “As we grapple with this threat, please note that the most modern antibiotic was developed over 30 years ago; which also now shows signs of resistance. It is a clear and present danger, for without antibiotic drugs to treat most human ailments, a simple disease could wipe out nations”. According to the Liberian Vice President, it is in cognizance of this threat, that Liberia has also joined the global One Health Plan which is an approach linking human, animal and environmental health sectors. She noted that this has proven to be one of the best models that strengthen cross-sectorial, national and inter-country capacity for integrated disease surveillance and response in the Economic Community of West African States (ECOWAS) and our global village.